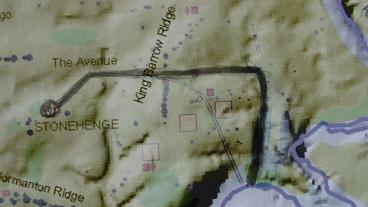 Below you will find the first ever analysis and argumentation for the transport route of the sarsen megaliths to Stonehenge, by water over the river Avon instead of overland…..
For over half a century the route of the transport of the sarsen stones (sarsen, specific gravity: 2.5) from the Marlborough Downs to Stonehenge as laid out by Atkinson has not been under discussion or seriously challenged by any archaeologists as far as I know, until a recent find of sarsen at Marden henge put this topic in the spotlight. This is remarkable because this route would have gone through marshes and over the extremely steep Redhorn Hill, but this is archaeology, a science, which is most of the time in sleep-mode when it comes to important theory it seems and only progresses by chance finds. For three centuries British archaeology is in the invaluable possession of the works of William Stukeley, an antiquarian and close friend of Isaac Newton, about whom he wrote a biography relating the famous ‘apple falling from the tree’- story. To be valued as a friend by Newton you probably had to have a bright mind yourself I suppose, so this is how I treat Stukeley and his work. He believed Druids were the builders of the megalithic monuments and conjectured they built them around 500BC, much earlier then his contemporaries thought. Regarding the Druids it is not altogether fanciful or weird to think that the megalithic architects and scientists were their precursers. Anyway he calculated what he called the Druid’s Cubit as being 52.83cm (20.8 inch), which is less than 5mm longer than the Megalithic Ell (52.36cm) that I propose and use in my work . He probably found this value by dividing the inner diameter of Stonehenge by the number 56 of the Aubrey holes. 56 x .528 = 29. 57m! (Burl’s measure= 29.60m) and got it confirmed in other measures, 208 (16×13) x .528= 109.82m! (Burl’s diameter of the overall perimeter = 110m), 164 x .528 = 86.59m (Burl’s diameter of the Aubrey-hole circle = 86.6m). (164 = 2 x 82, a supposed total number of the Bluestones, 3 sidereal months 3 x 27.3=82!) These are all crucial lengths and numbers at Stonehenge, 300 years ago as they are today. Although every standing stone circle expressed a number, archaeologists are not very interested in their numbers, they have no use for them. (Brodgar? Avebury? numbers not known, only conjectured, as of many other important circles, never excavated for that purpose; where a ‘superficial’ dig suffices). These numbers and the ratios in the design of their buildings are the only intellectual data Stone Age man has left us, but archaeologists are not interested. Even the highly significant recently found Blue-stone circle near Stonehenge is not further excavated for the purpose of finding a clear number, ‘some 25’ is enough for archaeologists, not ‘some 23’, for instance, as ever there stood in the centre of Stonehenge. Now it may seem that the apparent accuracy of Stukeley’s Cubit undermines my claims for my own Megalithic Ell, which is 5mm shorter, but I don’t see it that way, because my numbers as there are 210ME= 109.96m (Burl 110m) and 165ME (B: 86.6m) are also meaningful (165= 5 x 33 year sun-cycle, MacKie, Heath). Besides that I have always stressed my system is foremost a calculator, I don’t claim the precision, for instance Alexander Thom claimed for his Yard, which actually became his undoing, whereas still my measures stand up to any thorough scrutiny and remain more meaningful in mathematical and cosmological context than most others. So Stukeley’s cubit actually strengthens my case because I have found in him an undisputed early authority backing one of my principle lengths, that is, the Megalithic Ell, though with a 5mm difference, like with Thom’s Yard (6mm), differences which, given the inherent uncertainties about the exact measures, if ever there were, and the technical circumstances of the Stone Age itself, are not essential. My measures still make perfect mathematical sense, it’s up to others to further apply Stukeley’s Cubit and even if it turns out to be more precise in other places, which I doubt, it doesn’t touch the peculiar enigma of my calculating system which encompasses the most important measuring units of antiquity in clear whole number ratios. Once people start to appreciate the practicality, spirituality and beauty of this system, it will be used widely, I’m sure (although it may take a new generation of archaeologists to change their ways). There is obvious logic in Stukeley’s reasoning and measure and I must confess I am not able to get a whole number for the inner diameter length of Stonehenge in Megalithic Ell, but I do get it in Megalithic Yards, Remen and Feet, whereas Alexander Thom did not succeed with his Yard, nor with his Rod. Aubrey Burl, the doyen of the British stone circles, dismisses Stukeley’s cubit unit measure as erroneous and comes with his own (why not), but had he checked the merit of Stukely’s unit he would have found that indeed his own crucial measurements would have got him the significant whole numbers I give above and moreover his own sarsen circle diameter of 29.6m divided by Stukeley’s ‘cubit’ of .528m would have got him the number 56, being the number of the Aubrey holes, that bear his very name. The above picture of Stukeley depicts the huge sarsens he found at Clatford near the Kennet river close to the Marlborough Downs. Sarsen A (centre) is described on the picture as some 5 yards long and 4 feet high (thick) (4.60m x 1.20m), this is the right measure of a sarsen for the Stonehenge main circle, as he stated himself. I quote: ‘they are all very large, being about the size and shape of the stones of the outer circle of Stonehenge’ (see extensive quote below). The same stones were even mentioned and pictured by John Aubrey, another giant in early archaeology, nearly half a century earlier. Note the sharp edges and the text ‘rudely hewn’, which makes them definitely different from Avebury’s stones and akin to Stonehenge’s. Aubrey draws a circle whereas Stukeley does not clearly, but mentions a circle as well and draws some stones which seem broken up and moved. Stukeley’s picture may be pivotal in quelling the debate about whether Stonehenge was ever finished or not; it was most probably not! The main circle at Stonehenge counts 17 or 18 sarsen stones that made it all the way, may be a few more, here we find the rest, some 8 -12 stones. That they found indication of more dug stone holes at Stonehenge recently (by chance, because of drought and a too short hose pipe!) does not necessarily mean stones were actually ever placed in them (see the Aubrey holes). Would our Stone Age forbears arduously hew these stones to more regular proportions (it was a hell of a lot of work, the sarsen is extremely hard) at Clatford Bottom to keep such an amount in reserve, if need be, or for setting up a mini-Stonehenge? It seems highly unlikely. Look how regular most are pictured by Stukeley and Aubrey (‘rudely hewn’), compared to Avebury’s irregular sarsens, which seem not hewn at all. 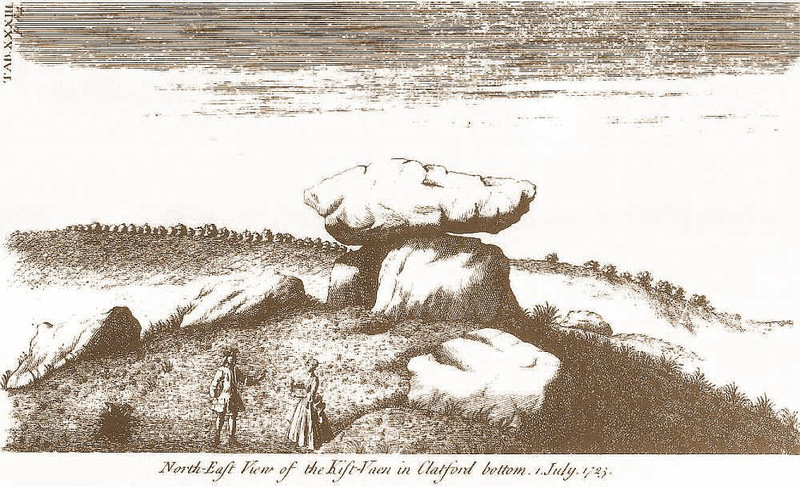 These early pictures also tell us that the route of the sarsens was down the Downs, past Devil’s Den, along Clatford Bottom, not up to Avebury as Atkinson argued fifty years ago; mind you: to get blessed by a priest; ‘spiritual benison’, he called it. Megalithic archaeologists seem convinced that they deal with a pristine religion here, priests and all, but it seems though their own self-conjured up religion they believe in, for which some like to act as the high priests themselves one wonders at times. one reaches the Kennet river either west of Fyfield or east at Clatford Bottom, the place where John Aubrey and William Stukeley found the huge stones; again, both resounding names in early archaeology, reporting on huge handled sarsens first hand, but completely out of the picture until only recently, as mentioned and still the stones that are known to lie there are ignored. Incomprehensible. The earliest reference is a description (late 17th century) by John Aubrey of “eight huge stones in a circle”, all of which “doe lie fall’n down”. 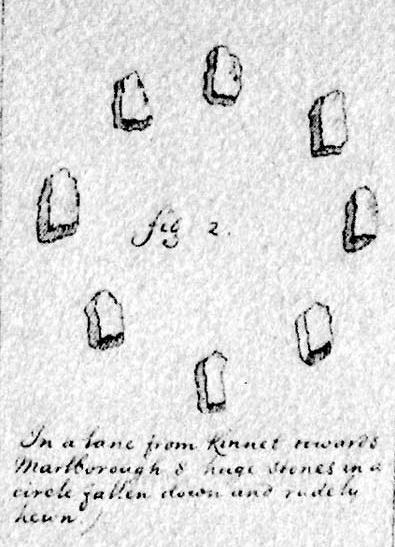 In 1723 William Stukeley referred to “twelve stones flat upon the ground in the middle of the road which seems to widen on purpose for it… Eight of them seem to lie in a circle…”. 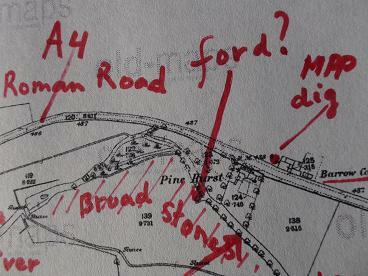 (see picture above,YG) The precise location of the stone circle is unclear; based on Stukeley’s description, place names and other documentary sources it has been suggested to lie south east of Clatford cross roads at ‘Broken Crosses’, or at ‘Broadstones’ where a widening of the road is suggested by the 1792 Inclosure Award. 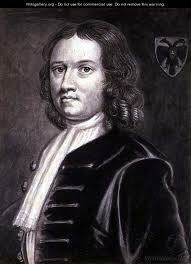 “In 1723 Stukeley noted that in the lane, or rather Roman Road between Marlborough and Devizes (wrong inference!! !,YG), over against Clatford and on the edge of the meadow just by the side of the Kennet, close to Clatford Bottom “lie twelve stones flat upon the ground in the middle of the road which seems to widen on purpose for it and takes a little turn, too, upon that account. Eight of them seem to lie in a circle (see plan (2)) and the other four may possibly have been the entrance or beginning of an Avenue; they are all very large, being about the size and shape of the stones of the outer circle of Stonehenge. I measured one, 16 1/2ft long, 2yds broad (5.03 x 1.83)…. There are two barrows within sight of it …. a little further westward you turn on the right into the fields which leads (leaving a barrow on the left hand) into the Clatford Bottom”. With close reading we find that it is obvious here that Stukeley is coming from the direction of Marlborough going westward, where you first get Preshute (before modern day Manton, see picture below far right), a very old parish (priest-hut), and then Clatford (far left), so we are here on the south side of the river in a lane, not on the Roman Road on the north side of the river. (Also John Aubrey again speaks of ‘a lane between Kennet and Marlborough’, not the well-known and 2 millennia old and used London-Bath road and he mentions (East-)Kennet (a village), older than West-Kennet (a hamlet), which is south of the river, again). 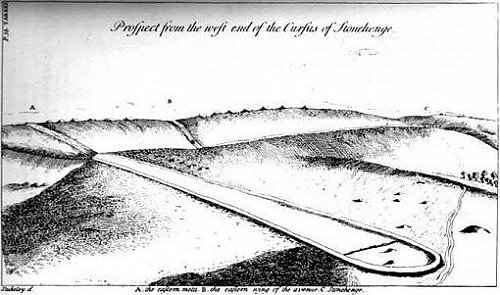 Then Stukeley says ‘a little further westward you turn on the right into the fields’ to get to Clatford Bottom (the bottom part of the Marlborough Downs near Clatford), ‘leaving a barrow on the left hand’, (on the picture) so the site of the stones was before the barrow, which is pictured on the other (north) side of the river with even a windmill in the distance which would have stood on top of the Downs. It even seems Stukely pictures the ‘bend of the river’, since trees get smaller in the middle of the picture and grow larger at the sides, the road then leads to the island in the bend of the river towards Clatford Bottom. So there can be little question about our lane being south of the river, as there is no question about the Roman Road (A4) being definitely north of it. The white curving line through the length of the picture is the Kennet river, the ‘flexure’ is to the left clearly visible, where there is even a small (manmade?) island in the river and after the bend downstream eastwards is a small creek, with trees today, this would have been the ford probably, somewhat further down there is a real ford today (see Google Earth), so fording the Kennet in that area was and is no problem, that is clear enough. Fording places are usually natural and used since time immemorial by humans. Somewhere in the triangle of land in the bend are big stones close to the river today, just as Stukeley describes. 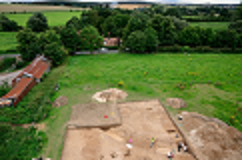 All rather straightforward one would say, but not for archaeologists, they dig somewhere else as we shall see. The trees in Stukeley’s picture suggest this is indeed the bend in the Kennet river, which Stukeley mentions in Burl’s quote: “over against Clatford at a flexure in the river we met with several great stones” (note Stukeley has given different descriptions, some more precise than others) so the picture is in the bend, because ‘against Clatford’, where moreover it is known sarsens are still lying till this day, the Broadstones, completely grown over and forgotten by archaeologists, no interest, but vital clues in ‘the route of the sarsens’, of course. It is true that Stukeley speaks elsewhere of ‘in the Roman Road’ but one letter change to ‘on the Roman road’ makes it equivalent to saying that ‘West Kennet Longbarrow and Silbury Hill are on the road from Marlborough to Devizes’, this does not mean they are physically on the road, but close by. Since Stukeley does write ‘in’ (at least it is transcribed as such) this is the only weakness in my argument, but he did make mistakes sometimes and there are different versions of the description, besides that ‘in’ may have been a way of saying it in those days, or it was actually written as ‘on’, but wrongly transcribed. Again the overriding argument is that it is hard to believe that the Romans would be negotiating these stones on their main road to London and Bath, it is rather unthinkable. Moreover there is no reason for another lane next to the Roman Road, since people from old were living on the south side of the river where there is ample space for fields and lanes, not on the north side. 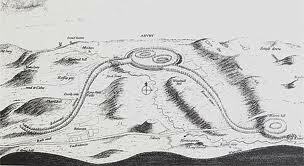 As soon as it became clear Marden Henge was involved in the dressing of sarsens, Mike Parker Pearson has launched a new theory on the trajectory for the sarsens: from the Downs over West-Overton, along Knap Hill to Marden Henge. 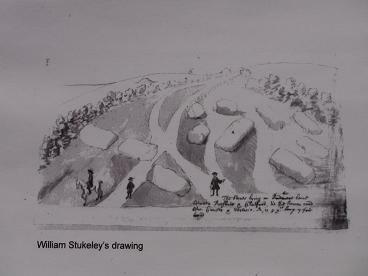 Obviously MPP and a couple of colleagues have thought it might be time to have another look at the Stukeley records, after 300 years, as the website makes clear and they dug twice at the wrong place to see if they could find traces of the stones Stukeley depicted. Mind you, we know big stones are lying in the field in exactly the area Stukeley describes, the Broadstones, very near by. So would it not be a better idea to define the type of these stones and if ‘sarsen’ start digging there to probably find layers and layers of sarsen chips, broken mauls, pottery, you name it, and get radio-carbon dates at sufficient depth and take it from there? It could have been the assembling place of the sarsens, where they got there first dressing to make them as light as possible for further transport. The whole Broadstones area full of chips and broken mauls, imagine! This scenario leaves us at least two routes at the beginning so as to prevent stagnation of transport, once, for whatever reason, a stone got stuck and would block the road for another transport. The other route would be the natural valley road, with several hairpins going down in the Vale to get to the Avon river. They knew how to use water for the transport of the Blue stones, now incontrovertibly proven by Bluestone-henge, so here I argue for the short-cut route from Clatford to the Avon and on to Stonehenge, the route I surmised now 15 years ago. Once down in the Vale the stones would be dragged past present day Oare and Huish to Pewsey where the river Avon finds a confluence of several of its springs, they may even have canalised it partly. As I claimed elsewhere the sarsens, like the bluestones were transported by water most of the way, which would also have been feasible from Marden henge onwards. Remember this, reader, there is nowhere any suggestion from anyone of using the rivers for the transport of the sarsen stones to this day, because the river is deemed too shallow, not? Since Marden Henge has forthwith to be taken into account as regards the dressing and transport of the sarsen stones it is necessary to also account for transport over water to that place. So in my account (some) stones could have been transported over the Avon river from Pewsey to Marden henge, which is right at the riverside, specifically for further dressing probably (the lintels!) since they were only ‘rudely hewn’ at Clatford Bottom, and would then from Marden be taken down to Stonehenge by river again. So let me now explain how I see the water transport. A lot can change in nature especially when humans interfere and that is what happened progressively over the last 5,000 years in Western Europe with the advance of agriculture and all that came with it. Europe was mostly one big dense forest some 7000 years ago, today forests are sparse in Western Europe. Enormous amounts of soil have been carried away by the rivers and filled their original beds. Holland, the Netherlands, where I come from is the delta of the Rhine, the largest river of Western Europe. In my country we are aware that a river has a summer and a winter bed, and the mighty Rhine is kept within bounds with long stretches of high winter dams. In Britain they seem to have long since forgotten about winter beds and started building houses on the floodplains; that’s why they get wet feet in places where rivers get swollen in times of heavy rain recently, which is during the winter usually. 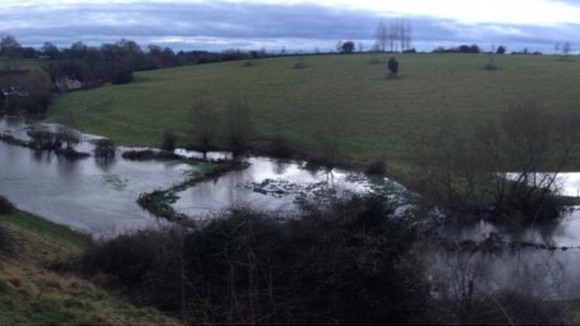 In a recent winter the river Avon, the subject of our study here, swelled to ten (!) times its ‘normal’ width in places with a volume of water not on the record yet. A quick-witted reader now already gets the point: there must have been times that there was enough water and depth in the river to transport the sarsen stones since they knew how to go about it, given the now, since finding Bluestone-henge, established transport of the Bluestones from Wales over the sea up the Avon river. (There simply is no better rationale for the Bluestone-henge being just in the place that it is). This practical knowledge may even have been the very reason they thought hauling the much larger sarsens from the Downs to the Stonehenge area was a feasible project. All they had to do is cut the trees along the summer beds, possibly slightly canalize the beds in places and wait for enough water to do the job, aided by building barrages to raise the water levels locally, all during the winter of course. This was the reason people came to Durrington Walls in winter time and brought their own food in the form of cattle and pigs, not to feast as Stone Age people are perennially deemed to do according to archaeologists, no, just to feed themselves as everyone else does and certainly does when engaging in big exhausting communal efforts and enterprises, like hauling stones over land and water or quarrying moats like for instance Brodgar and build from the huge quantities of quarried stones (where have they gone? well, to the Ness of Brodgar, of course!) 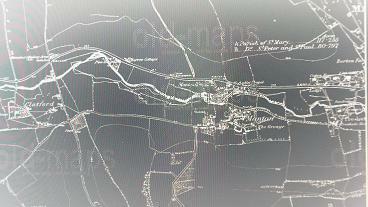 communal halls and kitchens, surrounding them by huge walls against the high and cold winds of Orkney for one thing. It is all practical and useful in my approach, nothing ceremonial per se. Important always is to wonder what people really need; what you would need in their circumstances, not ceremony and ritual, but shelter and knowledge of the seasons. So winter was the time to move the (big) stones (no work on the land) and the Grooved Ware people from all over the place descended on Clatford Bottom and on Marden and Durrington Walls henges to participate in the communal effort to build their ‘clockworks for the heavens’. It was this participation with many in something big, which was their spiritual high point and caused their ‘enthusiasm’, it became the hallmark of the agricultural revolution, the communal spirit, as we see it also in the graffiti of the Pyramid workers and as we see it in the ‘Rausch’ or ‘euforia’ of crowds to this day; it is not so much the celebration of the winter-solstice at Stonehenge, as the coming together of a unique and sophisticated culture which was possibly the first to use flat tables, benches and flat bottomed pottery in Western Europe. It was probably the Grooved Ware culture which set itself apart from others in its scientific and innovative approach to daily life as we see it in the insulated houses of Skarabrae built in a refuse heap! with its peculiar dressers, which were probably coolers and storage places for meat and vegetables, built high and deep to keep dogs and goats from stealing the food. All useful, practical and innovative; no showcases, let alone altars. So how did they go about ‘floating the sarsens’, the key question? We have to keep in mind that the sizes of the stones differ considerably. By far the biggest stones are to be found in the horseshoe setting inside the circle of sarsens, the biggest two are estimated at about 50 tons each, but also the circle contains massive stones of up to 30 tons, only the lintels are of relatively ‘reasonable’ size being over 3m long, a metre wide and 75cm thick on average, but still some 6 tons each (3.2x1x.75= 2.4 m^3, times 2.5 specific gravity= 6,000 kg); so for about 33 lintels that is 200 tons lintel weight alone. I hope the reader agrees that when I can make the case for floating the biggest stones it implies the others were feasible as well, so we go for the 50 ton upright (in weight similar to an army tank). ‘Specific gravity’ is crucial to our calculations so it must be explained first. All specific gravities of materials are ratios gauged against the weight of pure water, which is by definition 1. This means that 1 litre of water weighs 1 kg, sarsen stone has specific weight 2.5, thus 1 litre or better 1 cubic decimetre of sarsen rock weighs 2.5 kg. So our sarsen of 50,000 kg has a volume of 50,000 / 2.5 = 20,000 litre or 20 cubic metre. All materials with a specific gravity smaller than 1 float in water, like most types of wood, which range from about 0.4 (aspen, willow, poplar) to 0.65 (oak), some tropical types though sink. Let’s make it easy and suppose our wood has s.g. 0.5, this means that a volume of 20 cubic metres of wood weighs 10,000kg or 10 tons and can carry about another 10 ton of material before it definitely sinks, the principle of the raft, well known in those days. The Stonehenge builders had already found out with the Bluestones that when you submerge the stones in water they become much lighter because of buoyancy, you don’t have to be an Archimedes for that, it’s just experience, so you need less wood to make them float. This is the first trick they knew from past experience: submerge your stone and it becomes (40%) lighter, that is 20 tons in our case, that’s not nothing. So effectively for the 50 ton stone submerged we need 30 ton buoyancy which means 60 cubic metres of wood of 0.5 s.g. 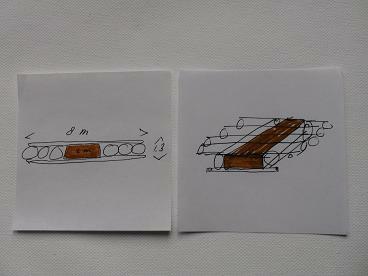 The crucial question is then how many tree trunks from what length deliver that volume of 60 m^3. We think of straight poplar trees (s.g. o.45) and then that we need a trunk section of an average of 1m diameter, this gives us a volume of 0.5×0.5×3.14=0.785m^3 of wood in 1 metre trunk, this times 13 metres = appr. 10m^3 wood, so we need about 6 of those average 1m diameter trunks of 13 metres long to get our 50 ton 9 m long sarsen stone just afloat, that’s all. The pictures show two different ways of doing it of which the right one seems the best because it uses the depth of the summer bed. It all depends on how deep and wide the Avon was in its summer bed, but it is obvious this is all feasible with between 1.5 to 2 metres of water depth and, as said, this could be achieved by building barrages, to begin with south of Upavon downstream of the major confluence of the Avon, where the initially two arms of the river, one from Pewsey, the other from Marden, join. This barrage would make sarsen transport from Pewsey to Marden an option and in the meantime they could start building barrages down river, with the last one downstream of the natural ford in the bend of the river at the end of the Stonehenge Avenue, near todays Amesbury. 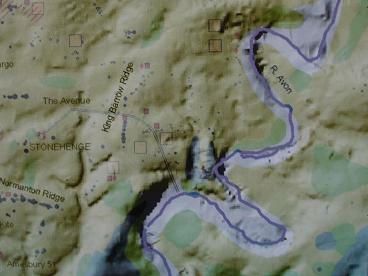 The lower picture shows the final route of the sarsen transport from the new-found ‘Bluestone circle’ and the ford in the river, not over the Avenue but along the easiest and most gradually climbing route through the valley nearby and then to Stonehenge, which is the black trajectory. 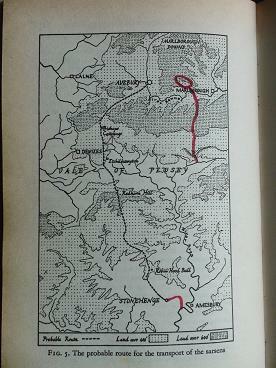 This route presents itself in the middle black relief in the upper picture. QED. Mystery of transport solved! This first assembling and dressing could have taken place at Clatford Bottom. This all ended when there was just not enough water anymore to move anything. Then when people would come year after year from far in vain, they would eventually stop coming. For half a century everything went well it seems from evidence at Durrington Walls and then the weather-gods turned against the Grooved Ware people again as this may have happened in Orkney where the land started to sink into the sea after the millennium long Neolithic Ice Age, with rising sea levels heralding the end of the flourishing Maeshowe Grooved Ware culture. Maybe others outside the Grooved Ware culture began to perceive it as an Evil culture with its cosmological knowledge interfering with Heaven, causing climate change and therefor sought to expel its people from the islands and eradicate all traces of it, as the Ness of Brodgar may be testimony of, buried as it got, as if it never existed and that even, with a warmer climate, their now obsolete refuge places with remains of some of their dead were completely sealed so their ‘evil’ spirits would no longer roam the land. Skarabrae, Ness of Brodgar, Durrington Walls and Stonehenge, all seem to have come to a sudden end. Will we ever know why? The number of Brodgar 66?